Hatchbacks rule in the growing car market of India. They form the biggest chunk of the annual car sales in the country. There are reasons behind the popularity of hatchbacks in India. They are the least expensive to buy, economical to maintain, easy to drive on crowded Indian roads, and take less space to park due to their size. So, here we present the best hatchbacks you can buy in India. Image: A newly-launched hatchback from the Maruti stable. The sheer number of Swift cars you see on roads is a testimony to the success of the vehicle in the country. The oddball design of car has been liked by young car buyers. With its solid looking design, the car has a strong presence on the road. With overall length of 3760 mm and overall width of 1690 mm, Swift looks bigger compared to other hatchbacks due to its design. 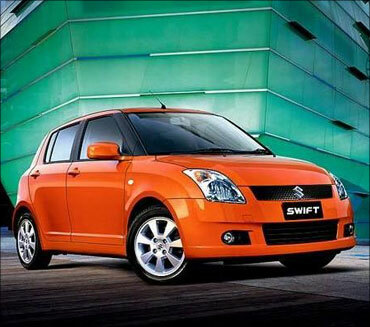 Now equipped with the refined and fuel-efficient K-Series engine, Swift delivers a great overall mileage of 17.9kmpl. The high-end version ZXI comes with ABS and airbags. Overall the car offers a great value for money. The South Korean auto maker Hyundai has seen great success in the Indian market. 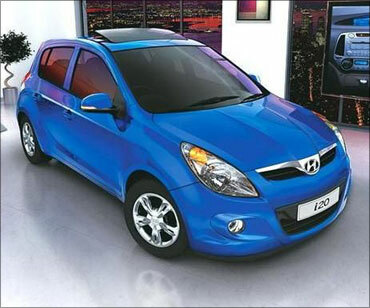 Launched in December 2008, the refined hatchback i20 has also been a success in the country. The car has spacious interiors that can seat five persons comfortably. The large boot space is also well appreciated in this car. The car's 1396 cc engine delivers maximum power of 100PS @5500rpm and maximum torque of 137Nm @4200rpm. The exterior design of the car is fresh. The car offers not-so-great mileage of 10.5kmpl in city, but its mileage of 16.5kmpl on highways is better. The high-end version Asta Option has six airbags and seat belt warning lamps for four passengers. 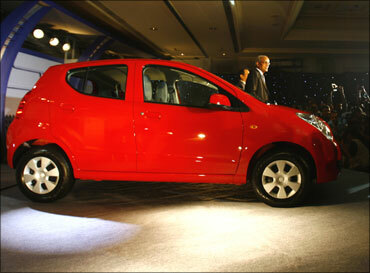 Recently launched Chevrolet Beat has sleek exteriors and comfortable interiors. The design of the car ensures many eyeballs when you drive the car on Indian roads. 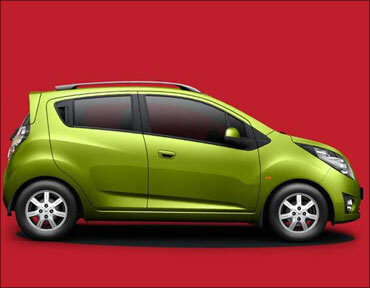 With overall length of 3640 mm, overall width of 1595 mm and overall height of 1520 mm, Beat is an attractive small car. Chevrolet Beat has lots of room inside. The car's legroom of 720mm is very much comfortable for passengers. On the down side, Beat has a small boot space. The 1199 cc engine of the car delivers power of 80PS @6200rpm and torque of 108Nm @4400rpm. The car offers a great driving experience. The car performs very well at twists and turns on roads. However, Beat does not perform well in the fuel efficiency department with an overall mileage of 13.8kmpl. Competitively priced, Beat is a value for money. Volkswagen entered India's competitive small car segment with launch of its hatchback Polo in February 2010. First showcased in India at the New Delhi Auto Expo in January 2010, Polo is expected to generate volumes for the German auto major. The car has generated great response in the market. 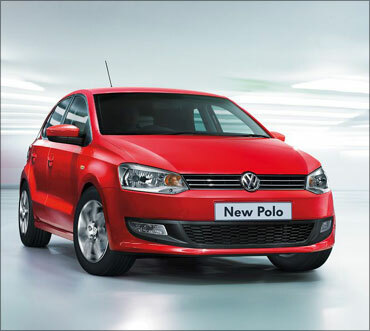 Polo has re-written the rules of hatchbacks with its great build quality and finish. The car has overall length of 3970 mm, overall width of 1682 mm and overall height of 1453 mm. The car has been given ground clearance of 168 mm, more than the European versions of the car, keeping in view the Indian road conditions. The 1198 cc refined engine of the car offers power of 75PS @5400rpm and torque of 110Nm @3750rpm. Polo is equipped with big cabin space and boot space. Ritz has a distinctive shape. It has a sleek tall boy design and spacious interiors. Its tall driving position is very useful while driving on congested roads. With overall length of 3715 mm, overall width of 1680 mm and overall height of 1620 mm, Ritz is a spacious car. It is equipped with a reliable and peppy engine. The 1248 cc engine of the car offers power of 75 ps @ 4000 rpm and torque of 190 Nm @ 2000 rpm. 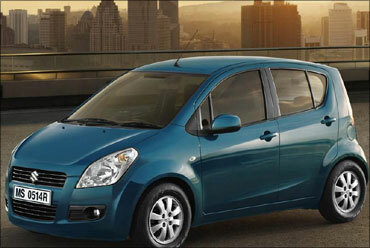 Coming from the stable of Maruti, it has great fuel efficiency, associated with the leading car maker of the country. It offers overall figure of 17.4kmpl. Ford had first showcased Figo in India in September 2009. The car was finally launched in March this year. 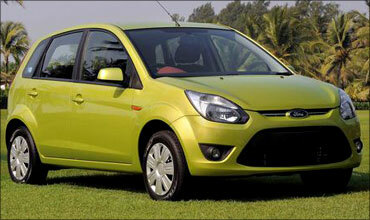 Figo is the only hatchback launched by Ford in the Indian car market. It is a comfortable car and sitting for long hours in the backseat does not make you feel tired. Driving experience is also good. Figo has overall length of 3795 mm, overall width of 1680 mm and overall height of 1427 mm. The 1399 cc engine of the car offers power of 69@4000 (PS@rpm) and torque of 16.3@2000 (kgm@rpm). However, the car's overall mileage of 13kmpl is disappointing. Ford Figo is sold in both petrol and diesel variants in the Indian car market. The versions include 1.2 Duratec Petrol LXI, 1.2 Duratec Petrol EXI, 1.2 Duratec Petrol ZXI, 1.2 Duratec Petrol Titanium, 1.4 Duratorq Diesel LXI, 1.4 Duratorq Diesel EXI, 1.4 Duratorq Diesel ZXI and 1.4 Duratorq Diesel Titanium. The car is sold in the Indian market in various colours including squeeze, diamond white, panther black, chill, Colorado red, moondust silver and sea grey. Fabia has overall length of 3992 mm, overall width of 1642 mm and overall height of 1513 mm. The 1422 cc engine of the car delivers power of 69 @ 4000 (PS@rpm) and torque of 15.8 @ 1600-2800 (kgm@rpm). The car has a great ride quality. The smooth handling is also liked by drivers. The USP of Fabia is its interior space. It has lots of legroom and headroom for passenger comfort. You can easily sit in the car for hours on a long drive without getting tired. 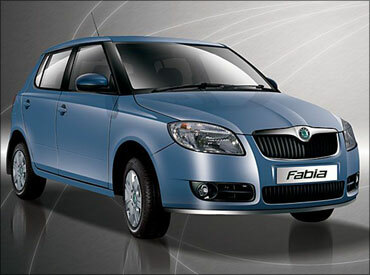 Fabia offers a respectable overall mileage of 16kmpl. The car is available in satin grey, corrida red, brilliant silver and candy white colours. 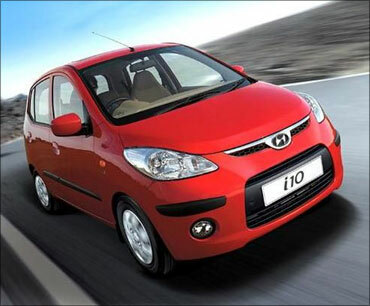 Currently, the best selling model of Hyundai India, i10 is known for its refined engine, performance and fuel efficiency. Launched in India in 2007, i10 is a premium hatchback which is fun to drive. Hyundai i10 has length of 3565 mm, width of 1595 mm and height of 1550 mm. The car has ground clearance of 165 mm and kerb weight of 860 kg. The 1197 cc efficient engine of i10 delivers power of 80 PS @ 5200 rpm and torque of 111 Nm @ 4000 rpm. The high-end version of i10 is equipped with features like power steering, steering adjustment, tachometer, front fog lights, tachometer, electronic trip meter, electronic odometer, anti-lock braking system, driver air-bags, passenger air-bags and child safety locks. 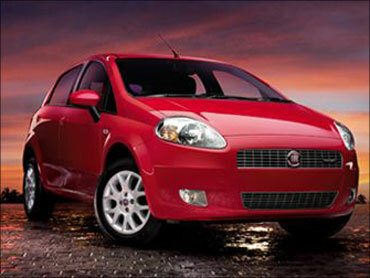 Launched in India in June 2009, the hatchback Fiat Grande Punto is available in both petrol and diesel versions. Manufactured at Fiat's Ranjangaon plant, the car has length of 3987 mm, width of 1687 mm and height of 1495 mm. Grande Punto's 1248 cc engine delivers power of 76 PS @ 4000 rpm and torque of 197 Nm @ 1750 rpm. The high-end version Fiat Grande Punto 1.3 Emotion Pack is equipped with many features like power windows, power door locks, power steering, alloy wheels, tubeless tyres, steering adjustment, tachometer and front fog lights. The car from the stable of the Italian auto maker Fiat has safety features like anti-lock braking system, driver air-bags, passenger air-bags, immobilizer and child safety locks.